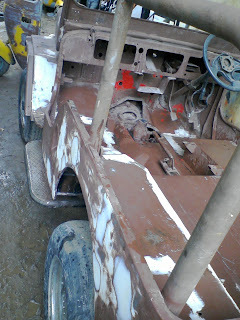 The picture here shows the past week's metal paste work. 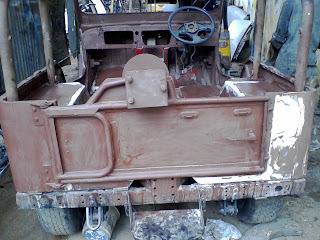 Actually the painter has rubbed all the metal paste neatly to get a good shaped rough surface. 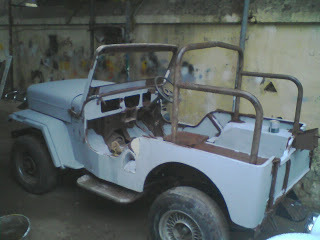 If you remember my last post about the tailgate work by the tinker, I recall it here with this picture for your review. 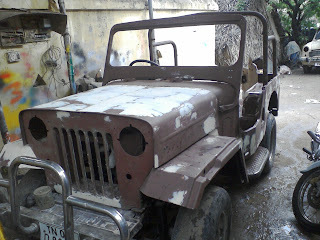 This was the condition I saw the jeep when I've visited during the last weekend. 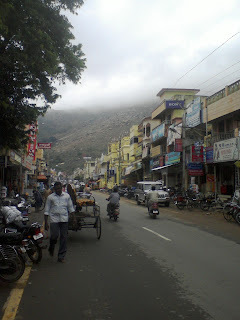 During the weekend, one day the climate was not suitable for the painting or related work, the town(Tiruvannamalai) where the work is going had rain fall and it was a cloudy day. So we were force to loose a day for the nature's demand. 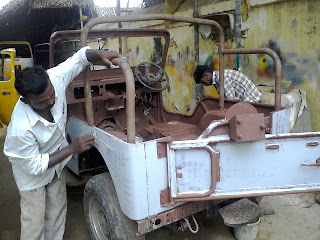 Later we applied NC putty and again the rubbing work to make the surface neat and shine. See it in the below picture.